Kvadra Mirror with perimeter-wise lighting, hand wave sensor and defogging. 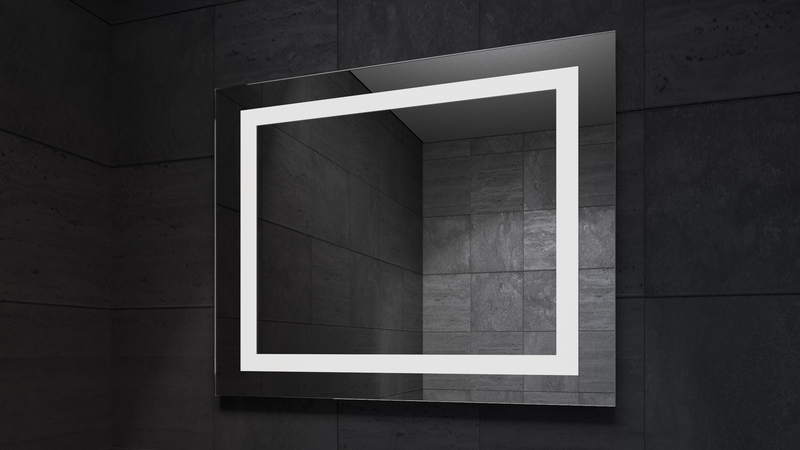 KVADRA Mirror – Strict Style. Kvadra LED Mirror for bathroom is made of quality materials, special glass and European mirror sheet. This model features square angles of the mirror, square angles of the perimeter-wise lighting stripe, as well as built-in anti-fogging option. Upon switching on this mirror, a hand wave motion at the bottom of the mirror turns on the perimeter-wise lighting and the defogging at the same time. This mirror may be positioned both horizontally and vertically. Kvadra LED is a medium production complexity mirror. The standard components include: the imported 5mm thick mirror sheet, the hand wave motion sensor switch, and the heating (defogging) measuring about A4. Width: 700 mm, 800 mm, 900 mm, 1000 mm.